The Gridforge grating from Locker Group is a range of industrial flooring solutions with endless application possibilities. Gridforge grating is suited for light, medium and heavy duty applications. Ideal for walkways, platforms and stairways, Gridforge grating products are available in 30mm, 40mm or 60mm load bar pitch, and 50mm or 100mm cross bar pitches. The grating offers choice of plain or serrated tread, sheets or stair treads. Locker Group's Gridforge grating is typically used for stair treads, plant platforms, catwalks, scaffolding walkways and roof walkways. Locker Group carries extensive Gridforge stock in numerous combinations of load bar and cross bar pitches. 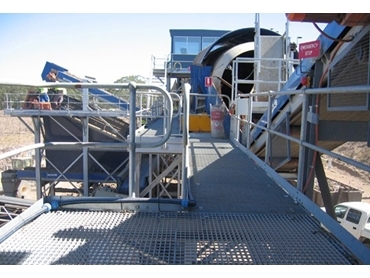 The grating can also be custom fabricated to suit specific requirements and supplied complete with stair treads, access platforms and tubular handrails. Stair treads are also manufactured to suit, and are available in a number of combinations of nosing and fixing methods.